A few days ago I have mentioned that Bradbury theme (and a new theme that is currently in development) is now fully compatible with popular event plugins like All-in-One Event Calendar and The Events Calendar. While setting up the multiple demos for Bradbury Education Theme I stumbled across a very annoying error in All-in-One Event Calendar plugin that I wasn’t able to replicate on localhost. Something went wrong while fetching events. 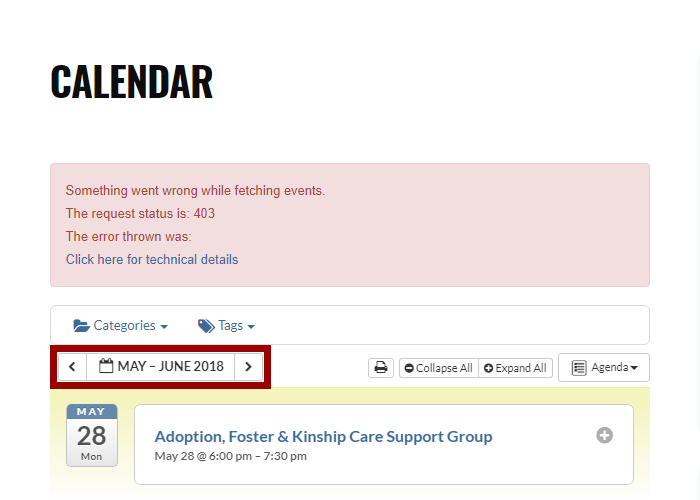 The error is displayed when clicking the calendar’s month arrows. The plugin’s support forum has information about incompatibility with a couple of security plugins, but I didn’t have any activated, so that made troubleshooting difficult. And then I remembered that I use the 6G Firewall (aka the 6G Blacklist) on most of my live websites, even non-WordPress websites. Just removing this line immediately fixed the 403 error for me. I posted this in the WordPress.org support forum for the plugin, but I also think it’s worth writing about here. All-in-One Event Calendar plugin has over 100.000 active installations, so it is very likely that there are other 6G Firewall users facing this error. I don’t know you. But I love you. This was the answer to my issue. I posted in the All-in-One support forum about this and included your link. God Speed to you, Sir!